The QUICK 20- to 80-Section Heavy Duty, High Production Clamp Carriers are the workhorses of the industry. 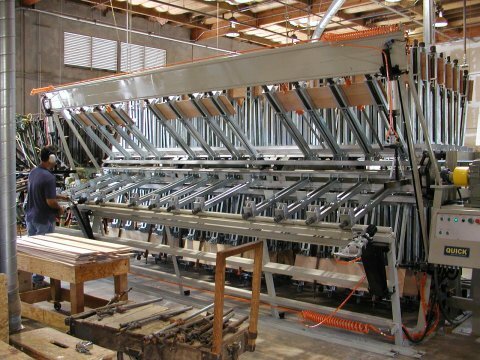 With their massive frames, super heavy-duty clamps and their industrial-duty hydraulic and/or pneumatic accessories, they are designed to provide many years of constant, multiple-shift production. Our Heavy Duty, High Production Clamp Carriers feature super heavy-duty zinc-plated clamps, Hydraulic or Pneumatic Clamp Tighteners, Pneumatic Panel Flatteners and fully Automatic Carrier Rotation Cycles. (See the Competitive Advantages page for detailed descriptions of these features.) 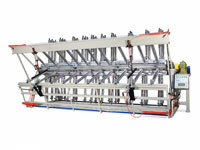 Machines can be outfitted with either one or two sets of Clamp Tighteners and Panel Flatteners. 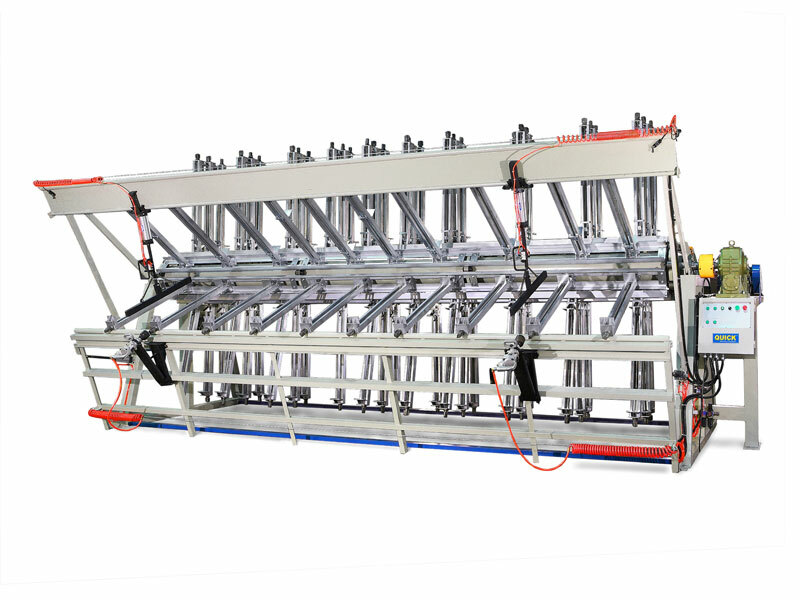 A Heavy Duty, High Production 8 1/2' wide, 40-section QUICK Clamp Carrier with Hydraulic Clamp Tightener, Pneumatic Panel Flattener and Electric Motor Drive is capable of producing over 900 edge-glued panels per shift (3 panels per section x 40 sections x 8 hours). 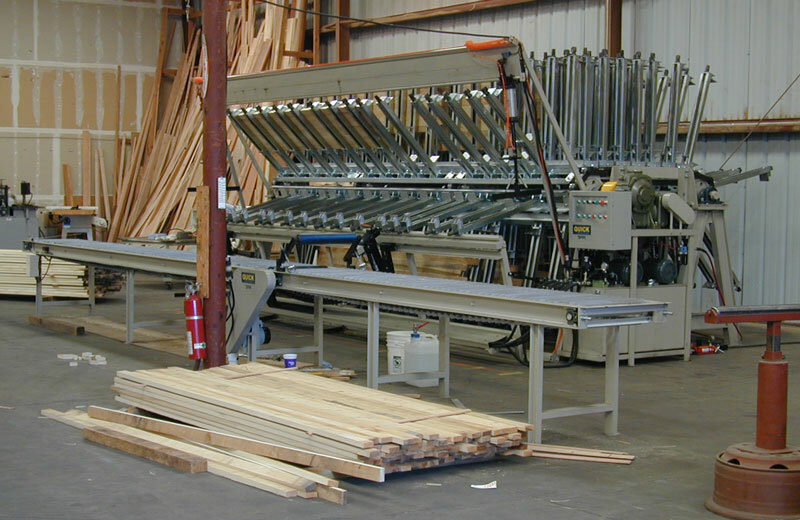 QUICK Heavy Duty, High Production Clamp Carriers are available in widths (maximum stock length capacities) of 6.5', 8.5' (standard), 10.5', 12.5' or 16.5', and 20, 30, 40, 60 or 80 sections. A 20-Section Heavy Duty Carrier can be expanded to 30 sections at a later date, and a 30-Section Carrier can be expanded to 40 sections, if desired. 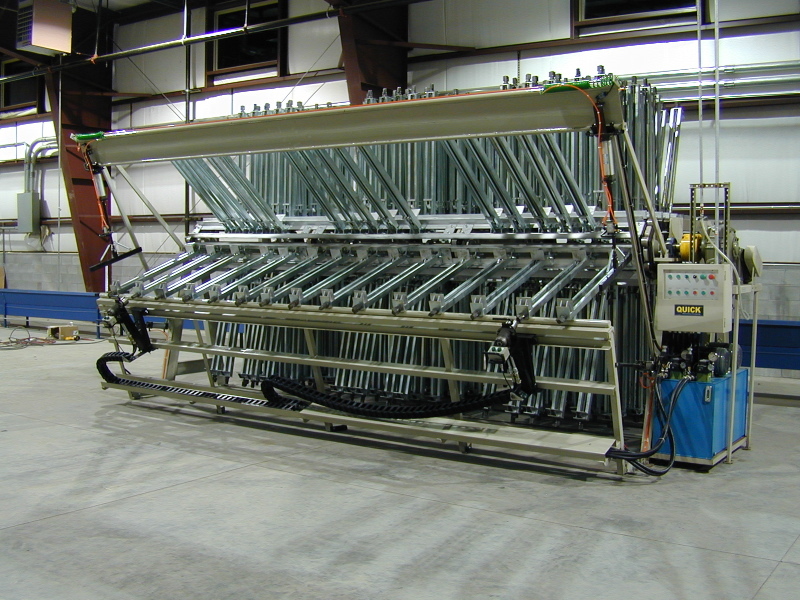 To view a high-resolution photograph of a 12.5' wide, 20-Section Heavy Duty Clamp Carrier with Hydraulic Clamp Tightener, Pneumatic Panel Flattener and Electric Motor Drive, please click on the image to the left. 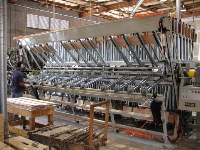 To view a high-resolution photograph of a 16.5' wide, 20-Section Heavy Duty Clamp Carrier with Two Hydraulic Clamp Tighteners, Two Pneumatic Panel Flatteners, Electric Motor Drive and 20" wide, 11' infeed, 17' outfeed Conveyorized Glue Applicator, please click on the image to the left. 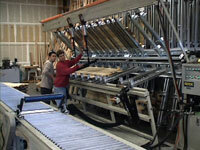 To view a high-resolution photograph of another 16.5' wide, 20-Section Heavy Duty Clamp Carrier with Two Hydraulic Clamp Tighteners, Two Pneumatic Panel Flatteners, Electric Motor Drive and 20" wide, 11' infeed, 17' outfeed Conveyorized Glue Applicator, please click on the image to the left. 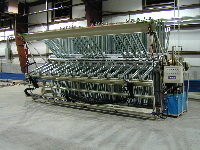 To view a photograph of a 16.5' wide, 20-Section Heavy Duty Clamp Carrier with Two Pneumatic Clamp Tighteners, Two Pneumatic Panel Flatteners and Electric Motor Drive, please click on the image to the left. To view a photograph of a 20.5' wide, 14-Section Heavy Duty Clamp Carrier with Two Pneumatic Clamp Tighteners, Two Pneumatic Panel Flatteners and Electric Motor Drive, please click on the image to the left. 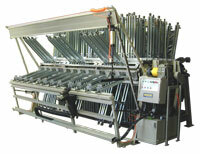 Our Heavy Duty, High Production Clamp Carrier frames are the heaviest, strongest and stiffest in the industry. 20-section and larger frames have oversize frame rails and runways, massive 3" diameter front and rear shafts (large-diameter shafts resist twisting when the Clamp Carrier is being indexed from section to section by the drive motor), big cast iron sprockets, heavy-duty chains with 2" wide rollers, and extra-stout 6" I-beam legs. 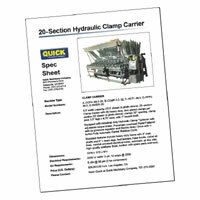 To view a high-resolution photograph of a 20-Section Heavy Duty Clamp Carrier frame, please click on the image to the left. To view a movie of a 30-Section Heavy Duty Clamp Carrier with Two Pneumatic Clamp Tighteners in operation, please click on the image to the left. 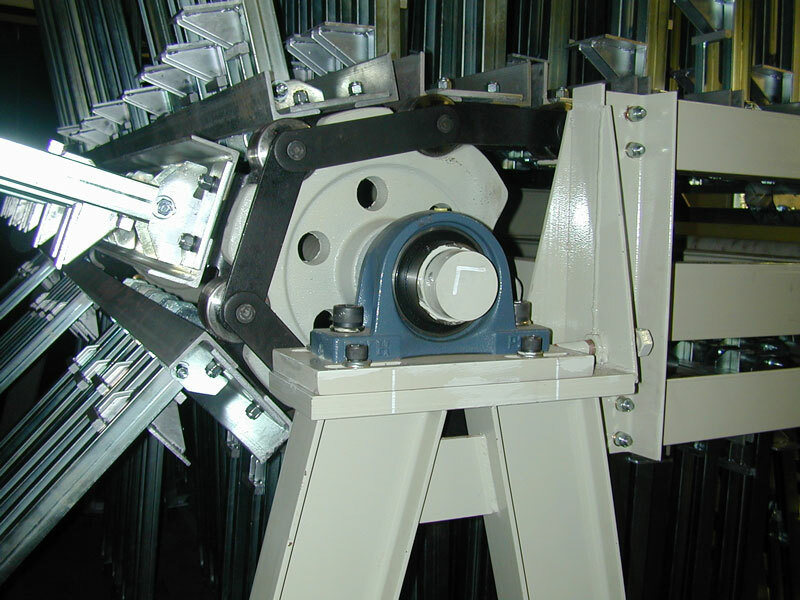 To view a movie of a 16.5' wide, 20-Section Heavy Duty Clamp Carrier with Two Hydraulic Clamp Tighteners in operation, please click on the image to the left. To download a PDF version of our 20-Section Heavy Duty Hydraulic Clamp Carrier Spec Sheet (1.5 mb), which includes specifications, electrical and air requirements, dimensions and example pricing, please click on the image to the left. To download a PDF version of a QUICK Heavy Duty Hydraulic 20-Section Clamp Carrier Installation/Operation manual, please visit our Manuals page by clicking on the image to the left.